A group of tombs dating back to the Spring and Autumn period (771-476 BC) has been discovered in central China's Henan Province, archaeologists said on Sunday. 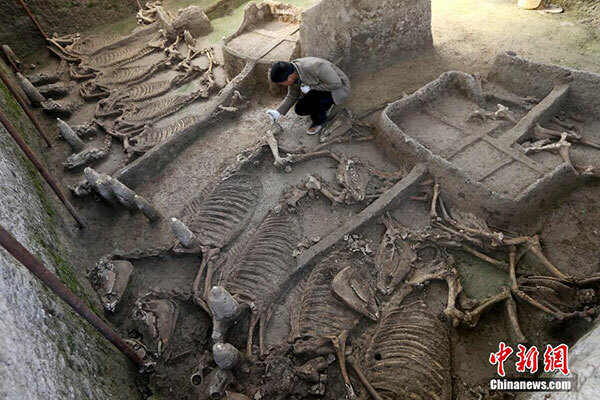 The grouping, located in Yichuan County of Luoyang City, is composed of more than 200 tombs, eight horse and chariot pits, over 30 ash pits and more than 10 kilns. It covers an area over 200,000 square meters. Alongside the tombs, an ancient city dating back to the Han Dynasty (202 BC-220) was also discovered. Archaeologists believe the site was home to an ancient tribe more than 2,600 years ago. The tribe was one of the few in the region whose migration and time of perish was recorded. Experts will study the tribe to learn the history of migration of minorities in the central area of China.